It’s in the 90s as I type this, and has been ALL. WEEK. We’re heading to the pool today. Some schools in the area have been closed due to heat. And the thought of wearing anything but flip flops seems like it’s forever away. Yet today, I made a Halloween craft. You see, I got to thinking. Many of you started following me years ago, when I basically posted thrifty crafts. There weren’t a ton of room makeovers, or walls coming down, or plank walls being put up. 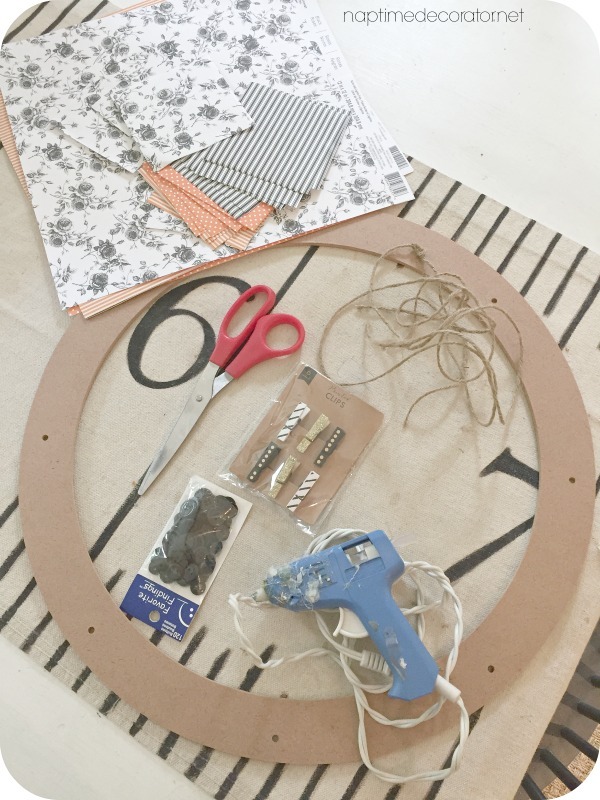 I was a busy mom of three (very) little ones, who just loved to make quick and easy (and inexpensive) crafts to decorate our home. During naptime, of course;). That was all I had the time and budget for back then. So I took a break from the family room shenanigans and went old school on you today. 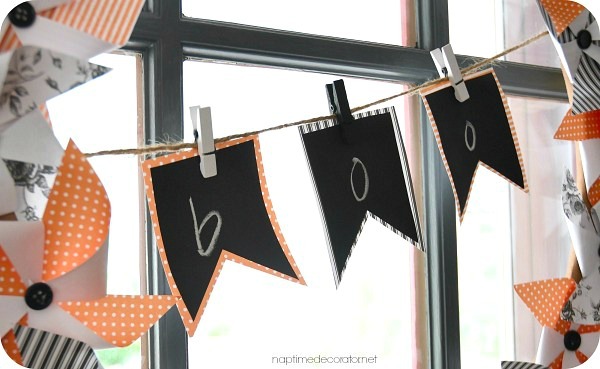 Here’s a fun craft you can make – during naptime and on the cheap;) Because I LOVE YOU. And I want you to know that I care about you and appreciate you and thank you SO much for sticking with me for so many years now. And since Fall is upon us – regardless of the summer weather here in Maryland – I made a Halloween craft. My kids go nuts for the Halloween decor – they get SO CRAZY EXCITED when they come home from school and see that I’ve gotten out the black and orange. Granted, this wreath went up for the photos and then I took it down – but next month they’ll love when it goes up. 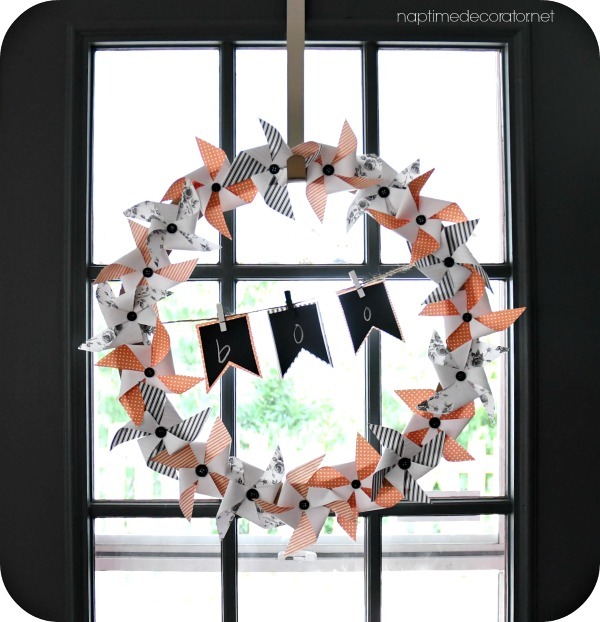 You might remember the Summer Pinwheel Wreath I made years back? The actual pinwheel tutorial is in this post, so I didn’t bother taking step by step photos again. 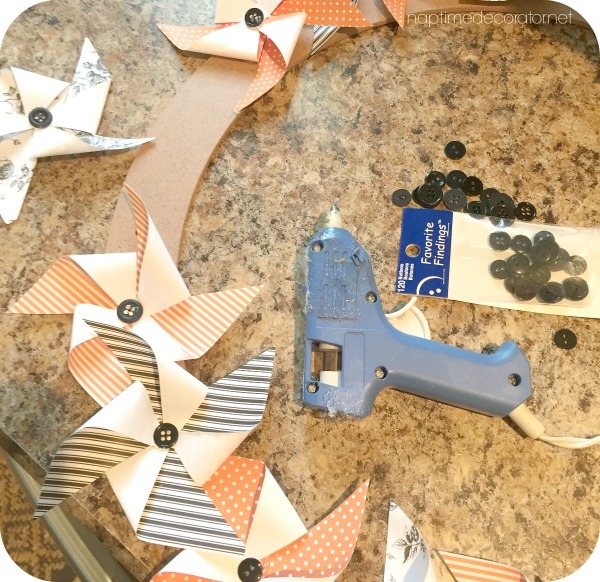 Once you’ve made your pinwheels, hot glue them to the wreath form. 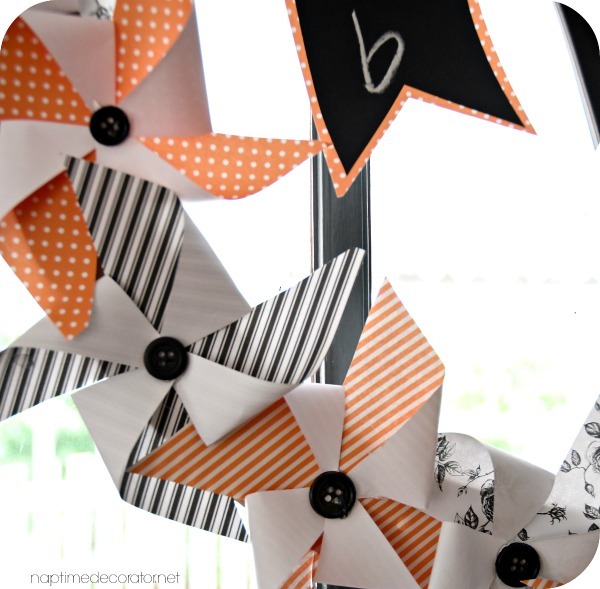 Just cut out the chalkboard paper into the shape you want, then glue it onto the extra paper you have leftover from the pinwheels. 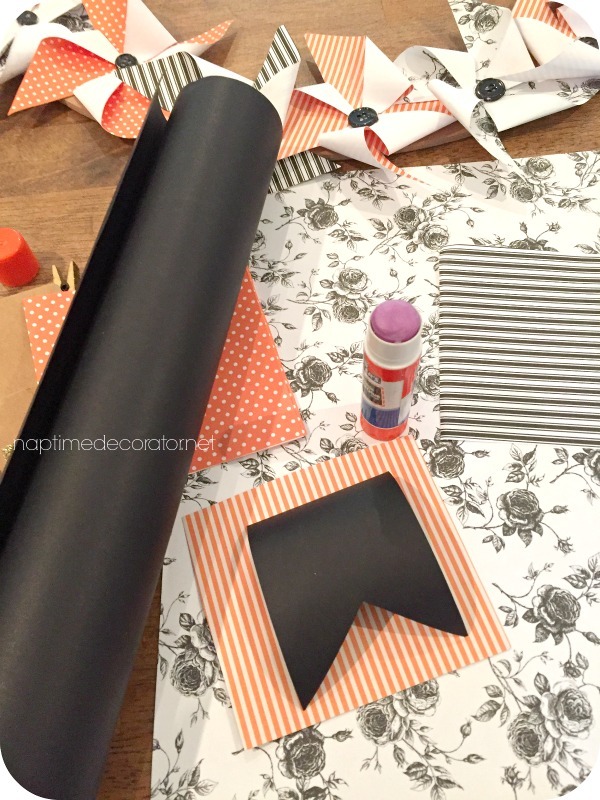 Following the same shape, cut the paper, just so the chalkboard paper shape has a little border. (You could use contact chalkboard paper instead and wouldn’t need the glue – I bought this paper by mistake, thinking it was contact paper, so just went with that). By the way – I’m putting this on an interior door – don’t think it would hold up on my front door, with the elements and all. And for those of you still into the family room makeover, I also got the unfinished table done today and can’t WAIT to show you!! Have an awesome weekend, friends – XO! School closed due to heat? That’s a new one for me. 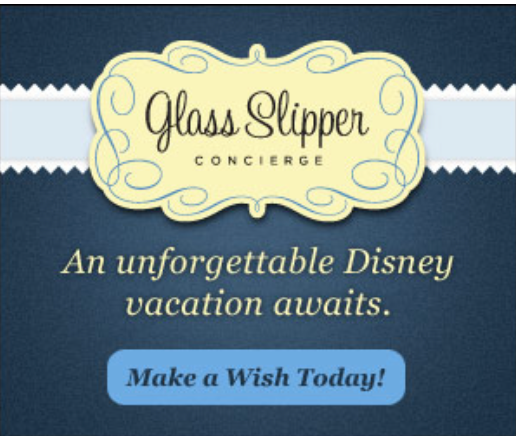 And- I wish! It’s been all 60s and low 70s here. 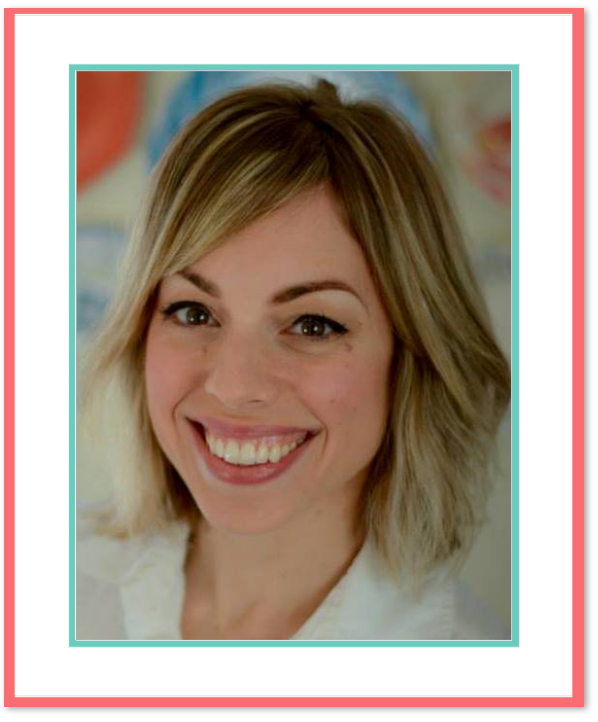 So cute, Liz! I love your craft posts as well as your room redos and Reno’s.